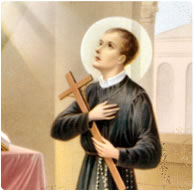 O good St. Gerard, powerful intercessor before the throne of God, wonder-worker of our day, I call upon you and seek your help. While on earth, you always fulfilled God’s designs; help me too always do God’s holy will. Beseech the master of life, from whom all parenthood proceeds, to bless me with offspring, that I may raise up children to God in this life and heirs to the kingdom of God’s glory in the life to come. Amen. O almighty and everlasting God, through the Holy Spirit, you prepared the body and soul of the glorious virgin Mary to be a worthy dwelling place of your divine Son. Through the same Holy Spirit, you sanctified St. John the Baptist, while still in his mother’s womb. Hear the prayers of your humble servant who implores you, through the intercession of St. Gerard, to protect me amid the dangers of childbearing and to watch over the child with which you blessed me. May this child be cleansed by the saving water of baptism and, after a Christian life on earth, may we, both mother and child, attain everlasting bliss in heaven. Amen. This entry was posted in Belief, Believe, children, Faith, LOVE, motherhood, saints, women on October 16, 2018 by CSSF.